I wish I had the story...or at least a small anecdote...to share about how today's recipe came to be, but the truth is most of the details are lost to me now. I developed these bars for a class that I taught a year ago, and although I usually make detailed notes about the progression of a recipe, I have discovered that with this recipe, either I didn't make very good notes...or I have somehow misplaced them... What I found in my files was pretty cursory. This is really rather unfortunate because I do know from the notes that I have—and my memory of the process—that I made no less than four versions of these bars before finally landing on the one I liked best. 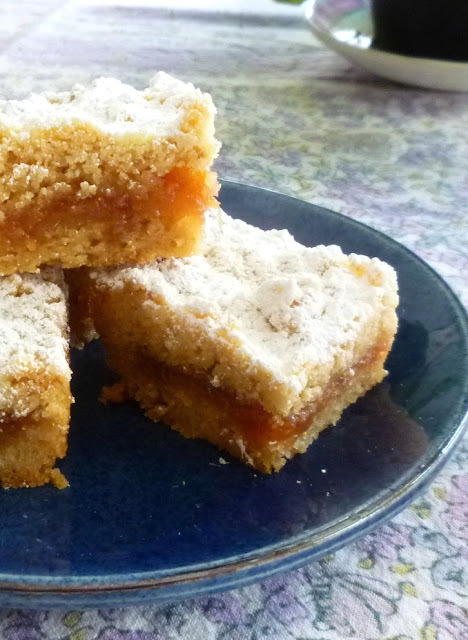 What I can tell you is that I started out with the Rhubarb Browned Butter Bars from The Big Sur Bakery Cookbook. 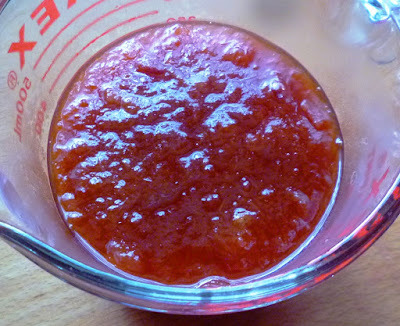 The rhubarb jam from this original recipe is outstanding...and I used it unchanged. Instead of just cooking the rhubarb with the sugar to a thick compote, this recipe directs you to reduce orange juice with the sugar to a caramel before adding the rhubarb. This method produces a concentrated and intensely flavorful jam. If you are able to get the blood oranges called for, the color of the jam will be spectacular....although Cara cara oranges produce a beautiful result too. But even if you can only get plain old Navel oranges, this jam is worth making while rhubarb is in season—just to have on hand to spread on toast...or scones... or stir into your breakfast yogurt. I also love the use of browned butter in the original recipe. If you have never experienced browned butter, you are in for a treat. It is also a "stand alone" kind of preparation—delicious with fish...and pasta (particularly filled pastas and gnocchi)...or drizzled over vegetables (especially asparagus). 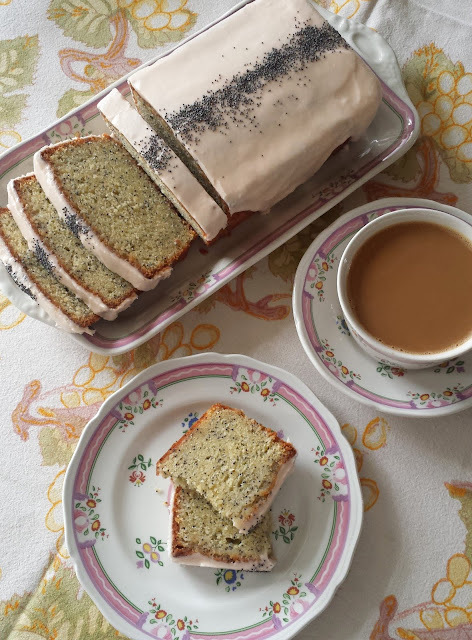 I sometimes slip it into desserts and baked goods where it adds a nutty, complex undertone. I used it in my Butter Pecan Ice Cream. 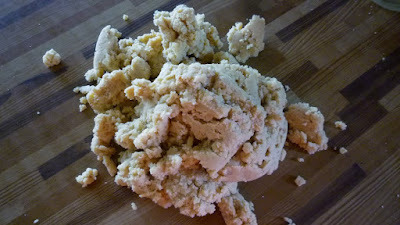 If you haven't made browned butter before, I included a picture and a few pointers for making it in that post. 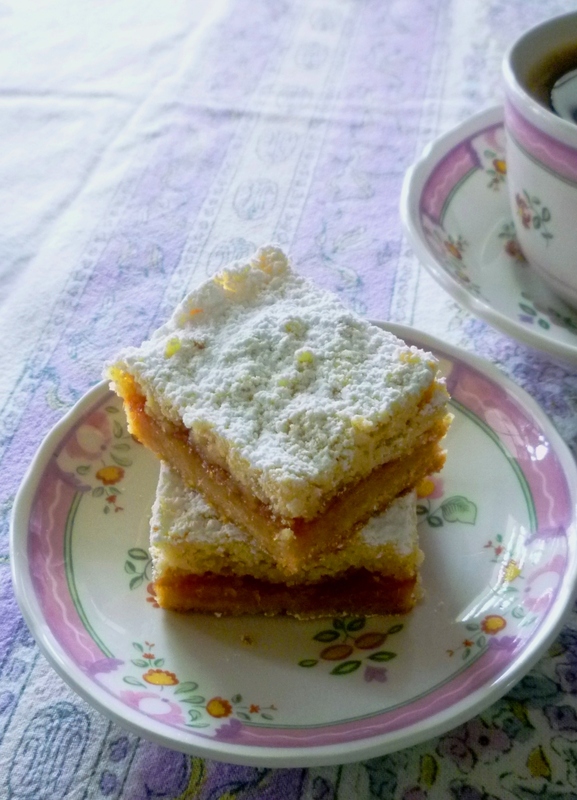 The recipe I ultimately used for sandwiching the jam was adapted from Gale Gand's Hungarian Shortbread Bars (from Baking with Julia). Besides substituting chilled browned butter for the whole butter called for in her recipe, I reduced the total quantity of dough by a quarter. 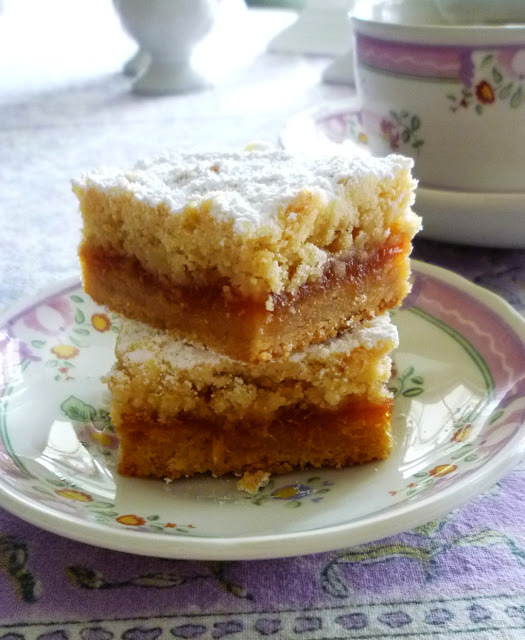 The shortbread portion of these bars is delicious...but I didn't want it to overwhelm that special rhubarb jam. Furthermore, I opted for pre-baking the bottom crust since this produced a bar that was slightly firmer and more stable for picking up and eating with your hands. But make no mistake, this is not a firm or a crisp bar cookie...it is soft, tender and cake-like. 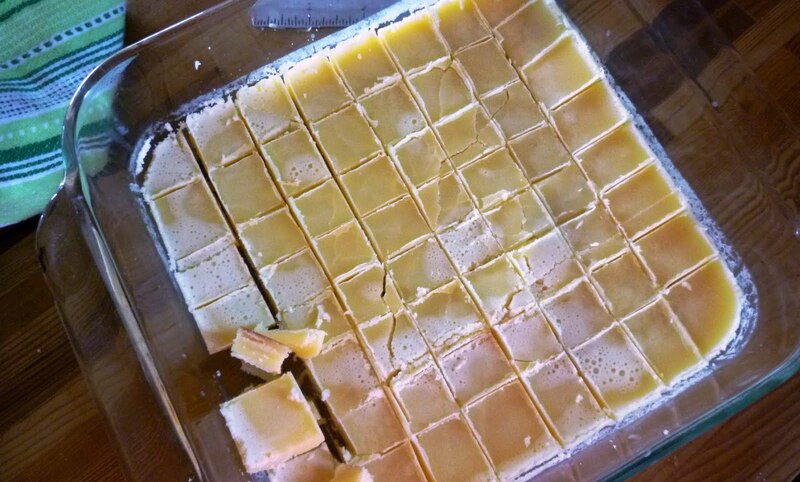 In fact, if you were so inclined, you could cut larger squares and serve them topped with scoops of ice cream for a more substantial, eat-with-a-fork kind of dessert. This will be the third jam/fruit compote-filled crumble bar recipe that I have posted (I love these kinds of cookies). In general, I think of this style of bar as quick and easy to make—and certainly the first two that I posted fit this description. This bar fits the mold in that it is fairly easy to make. Unlike the others though, it is not particularly quick since you have to make it in several separate steps. I find that it works best to make the jam and the browned butter the day before you want to bake and serve the bars. You could get away with making these two components in the morning before baking in the afternoon—but the process will feel more calm and leisurely if you take a two day approach. Either way, these bars are delicious. And if you love the bright, tangy flavor of rhubarb, I think you will find the extra time involved to be totally worth it. Place the butter in a wide pan set over medium heat. As the butter begins to sputter and pop, whisk occasionally. The butter solids will begin to turn brown. When the solids are a deep golden brown and the butter has a pleasantly nutty aroma, immediately transfer to a shallow heat-proof container (a 9- by 9-inch baking pan or casserole works well). Chill or freeze until solid. 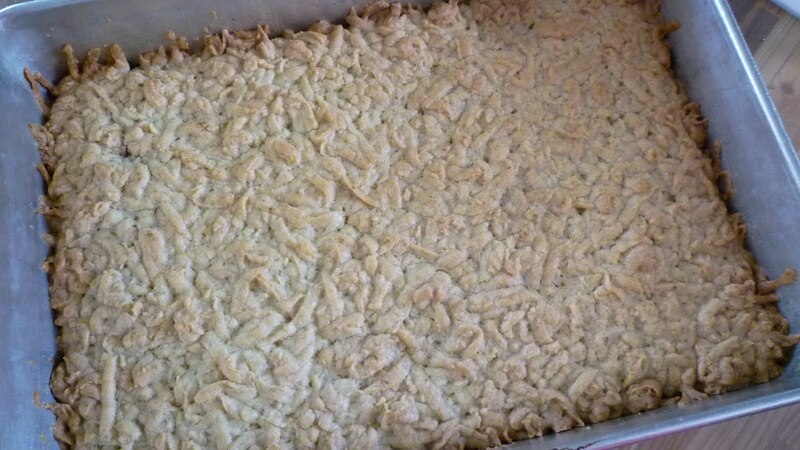 When ready to bake the bars, butter a 13- by 9-inch baking pan—concentrating most of the butter on the sides. Line the bottom of the pan with a square of parchment (it is not necessary to butter the parchment). Set aside. Place the flour, baking powder salt and sugar in the bowl of a stand mixer. With the paddle attachment, mix on low just until homogenous. Cut the cold, browned butter into cubes and add to the bowl. Mix on low to medium-low until the mixture looks like damp cornmeal...there shouldn't be any large clumps of butter visible. This will take anywhere from two to five minutes, depending on the temperature of your room. Whisk the yolks, water and vanilla together and drizzle in with the machine running. Mix until the dough comes together in clumps. Transfer half of the clumps (540 grams/19 oz.) 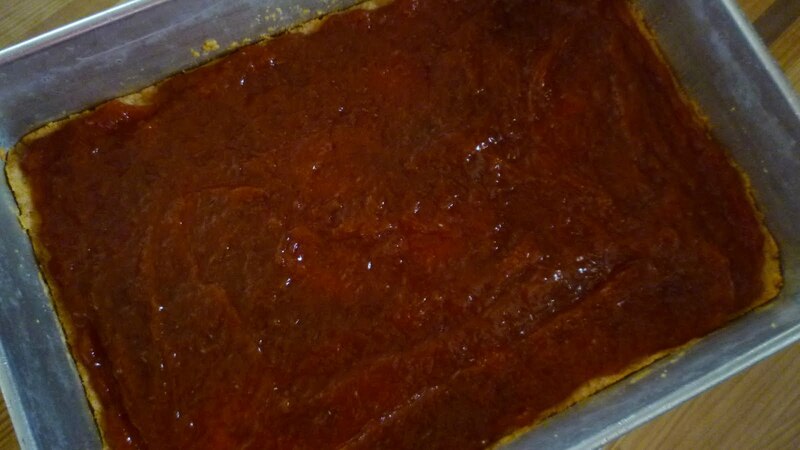 into the bottom of the prepared pan. Bake in a 350° oven until pale golden around the edges—about 15 to 18 minutes. Cool the crust to room temperature before proceeding. To build the bars, spread the cold rhubarb jam in an even layer over the cooled crust, spreading to within 1/4- to 1/2-inch of the edges of the pan. Using the coarse holes of a box grater (or, you may use the grating disc of the food processor), grate the chilled dough evenly over the jam (or grate onto parchment and use the parchment to transfer and scatter the dough over the jam). Do not press down—just make sure the bits of dough are spread in a reasonably even layer. Transfer to a 350° oven and bake until golden and springy to the touch in the center—about 35 to 40 minutes. Place the pan on a wire rack and immediately dredge thickly with powdered sugar. Cool completely before cutting. Makes 32 to 48 bar cookies...or 12 large dessert squares. Place the juice, zest and sugar in a medium saucepan. Bring the mixture to a boil over medium-high to high heat. Continue to cook until the syrup begins to turn a pale caramel color around the edges of the pot. Add the rhubarb. Continue to cook, stirring with a wooden spoon, until the rhubarb becomes a thick, smooth and glossy jam—about 10 minutes. Transfer to a clean container and chill. You should have 1 1/2 cups—or 1 lb.—of jam. Note: The original recipe called for Blood oranges. I have made this with Blood, Cara cara and plain old Navel oranges. It is good no matter which kind you choose. 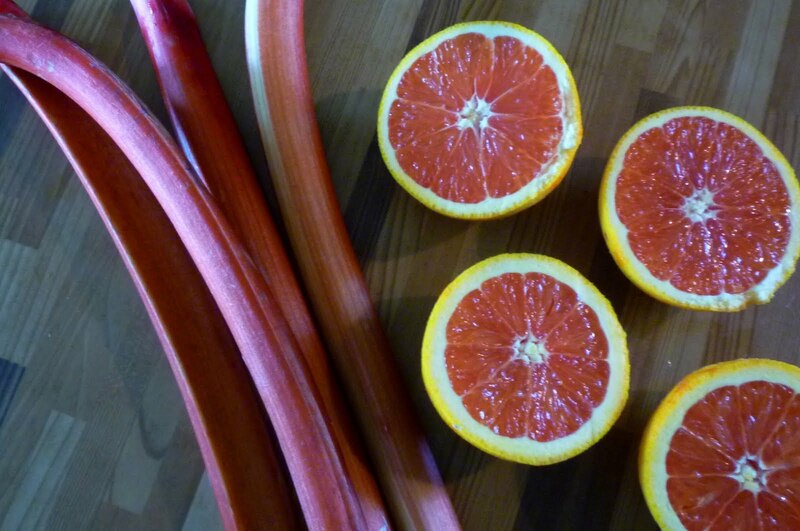 It is especially beautiful...and a bit sweeter...if made with blood oranges. I imagine Valencia oranges would be exceptional. You should get 1/2 to 3/4 c. strained juice from 2 oranges.